This is a quest item for the "Eyes of the Past" quest. The quest is a Dark Elf quest related to the war. Xon Quexill gives this quest. It is a timed quest, 6hrs. 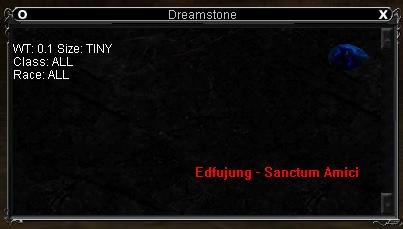 BTW, I am on this quest and need the Dreamstone. If you have it and are on Maelin Starpyre, please send me an email. I had my druid in UP by the zone line, and we pulled and killed a Dark Assassin who dropped this as loot. I was the ML in the group, and after we were done, we went to PoK for me to sell and split loot. No one knew what this stone was for, figured it was vendor trash. The little gnome by the Little Bank in PoK was willing to pay out around 211pp for it, with my CHA at 100. Gonna hold on to this, like everyone else, to see what it is for. None being sold in Bazaar either, on the Saryrn server. C'mon, Sony, tell us what it's for!! I got one the other day, holding on to it untill I can find out what its for. Dropped from a Dark Assasin for me...What is this for, since it is new, must be for something...or extremly rare.